Monday (15/5), David Day Tjahjono, Head of Manufacturing Process of PT Nestle Indonesia, shared his experiences in a seminar on campus of the President University (PresUniv). 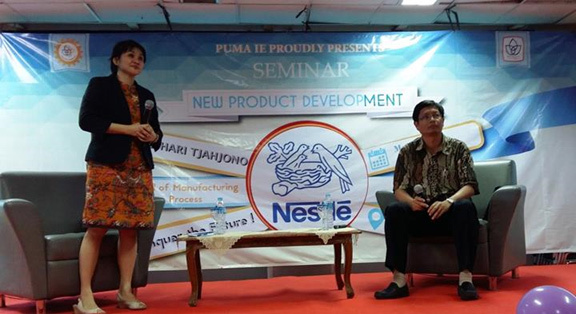 In a seminar with the topic of New Product Development, and hosted by President University Major Associations (PUMA) - Industrial Engineering, Hari shared his knowledge about how Nestle Indonesia developing new products. The seminar was opened by the Vice Rector I for Academic Affairs, Josep Ginting, and was attended by more than 100 PresUniv students. Referring to the Nestle experience, Hari described, new product development in the company aims to increase sales and market share. Hari said, "In addition, development of new products in the Nestle Group, including Nestle Indonesia, also aims to improve profitability and meet compliance standards." Hari (right) in New Product Development seminar hosted by Anastasya Lidya Maukar,ST.,M.Sc.,M.MT (left, standing), Lecturer of Industrial Engineering of PresUniv,as the seminar moderator Monday (15/5). Furthermore Hari revealed that the development of new products in Nestle was also triggered by various causes. "Among other things, changes in consumer needs and preferences, as well as business competition. In addition, there are also new product development which is influenced by changes in the environment and technology. " These were the part of material that Hari presented in a seminar at PresUniv campus. See you at the next seminar.